Dirk Nowitzki’s Dirkburger is cool, but where does it rank among other athlete-inspired food? Back in February, the Mavericks decided to honor legend Dirk Nowitzki with his own cheeseburger, which had us wondering: How does the Dirkburger stack up to other foods inspired by athletes? 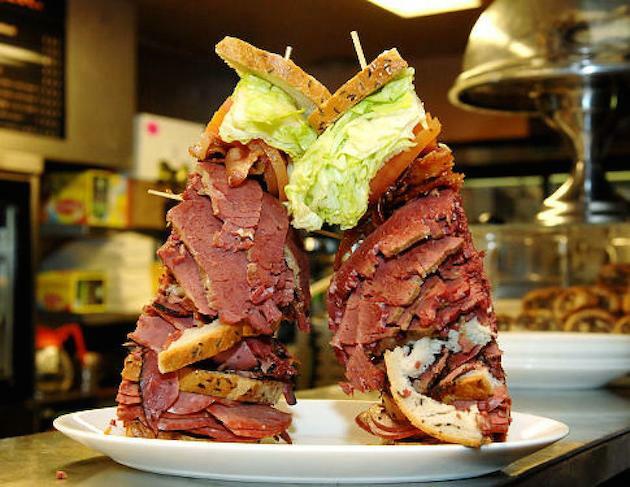 ​Carmelo Anthony’s sandwich at the Carnegie Deli loses points for a few reasons. First of all, Carnegie does this sort of thing all the time when a person is in the news, like Tim Tebow. More importantly, this isn’t as much a sandwich as it is a huge stack of meat. ​Peppi’s in Pittsburgh has plenty of items honoring Steel City sports icons, but the one named for the guy whose name sounds most like a food isn’t anything too creative. It’s hamburger meat and sausage with egg and American cheese on a hero roll. If you’re looking for something with character, the Joey Porterbella (a cheesesteak with mushrooms and horseradish) is the way to go. 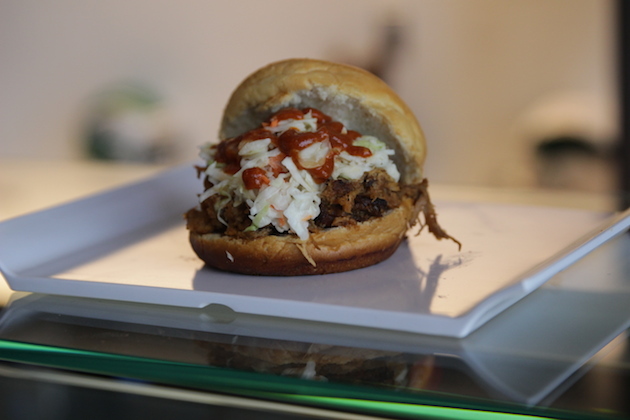 Former Eagles receivers Mike Quick and Harold Carmichael opened a barbecue joint together after they retired called, incredibly “Quick & Carmichael.” The Eagles started selling sandwiches from the duo back in 2014—“The Quick” with pulled pork and coleslaw, and “The Carmichael” with pulled chicken and coleslaw. Or, for the indecisive, there’s “The Quick and Carmichael” with pork and chicken. Before he was the most-hated player in the NBA, the Cavaliers decided to give Matthew Dellavedova a burger with deli meats. The capicola looks like raw chicken. ​No, Michael Kidd Gilchrist’s honorary burger at The Cowfish in Charlotte doesn’t get its name from his initials. The acronym actually stands for Motor Keeps Going. The burger itself is an inspired concoction: a turkey burger with raclette, spinach, fried leeks and topped with hot pepper jelly. Marshawn Lynch’s item at CenturyLink Field is a typical bacon cheeseburger with a few add-ons, like onion rings and ham. 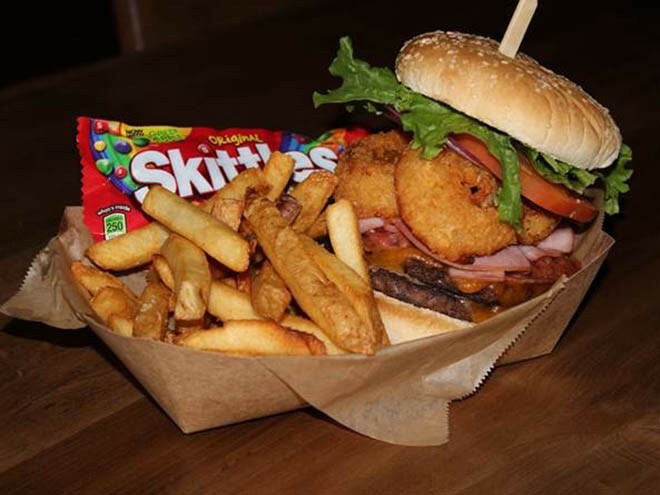 It’s served with fries and (of course) Skittles. Now that he’s retired he can finally eat one. You have to commend Doddy’s Cafe in Paris for being creative with their homage to PSG’s Zlatan Ibrahimovic. The four bold cheeses certainly capture Ibra’s spirit. But weighing in at over a pound, it seems a bit like a gimmick. ​Oversized food may seem out of place in a Parisian cafe, but it’s what American ballparks do best. Back in 2012, the Nationals unveiled an eight-pound Stephen Strasburg-inspired burger made with ground brisket, chuck beef and short ribs. It’s topped with all the usual stuff—cheese, lettuce, pickles, tomatoes, etc.— and served with a basket of French fries. 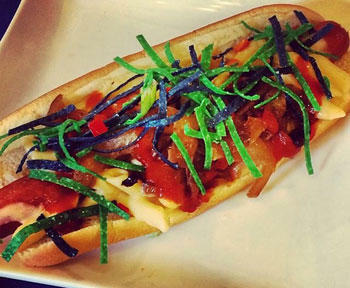 The Seahawks’ Russell Wilson hot dog is a cheese dog with a twist—the cheese is mac and cheese. It’s topped with caramelized onions and honey-Sriracha hot sauce, plus Seahawks-colored tortilla strips. When Italian soccer legend Andrea Pirlo joined NYCFC last summer, Howler Magazine and sandwich shop No. 7 Sub teamed up to offer a sub in his honor. It’s a pretty traditional Italian sandwich—Genoa salami, fresh mozzarella, fried zucchini—but it has the very interesting addition of pickled blueberries. Somehow, Mavs rookie Justin Anderson got a burger before Dirk. And what a burger it is. Served on Texas toast, the burger accompanied by deviled egg aioli, bacon and provolone. Sriracha fries and a Sriracha-cheese dipping sauce come on the side. This is another creation from American Airlines Center executive chef Mark Mabry—a 1/3-pound burger on Bavarian pretzel bun with jalapeno beer cheese, bacon onion marmalade, arugula and a mustard horseradish aioli. Everything about that sounds great. And it’s only $12, with fries.